Thank you for joining me and making my Free Mystery quilt, Vacation Time! September brings me to the Fair. The county fair, a carnival, a fireman's fair.. or maybe an amusement park. And what do we find there? A Ferris Wheel! When on vacation I like to do something I don't do in every day life. Vacations are for taking a break and visiting a the local fair is a lot of fun! During my travels across the country to teach we often see a carnival or a fair. It might be in a parking lot next to our hotel, or a bigger county fair. And what do they usually have? A Ferris wheel! I'm in love with the shape of them, big circles, spokes and often fun colors. I believe they are beautiful and at night they light up.... what can be better than that? Oh.. you can ride them too! The Ferris wheel was created when a challenge was issued in 1890 by the Engineering team that was creating the Chicago World's Fair exhibits. They wanted something that would 'top' the Eiffel tower and amaze the crowds. George Washington Ferris drew the first sketch and it was not a block buster idea right away. How the first one came to be built is a GREAT story of someone that believed in his dream and made it happen. I like this video on it, and you can read more at the Smithsonian website link below. Ferris Wheel against the sky Takashi Hososhima photo credit. Night and palm trees Woolennium photo credit. Let me share a little story with you. When my family moved to Germany we rented an apartment. Just a few blocks from us was a fair ground. In the fall the local Octoberfest was held there, and guess what they had? A Ferris Wheel! The best part was that our apartment had a balcony that looked out towards the fair grounds. So at night we could sit there and see the wheel go round and round... that might be the start of my love affair with them. 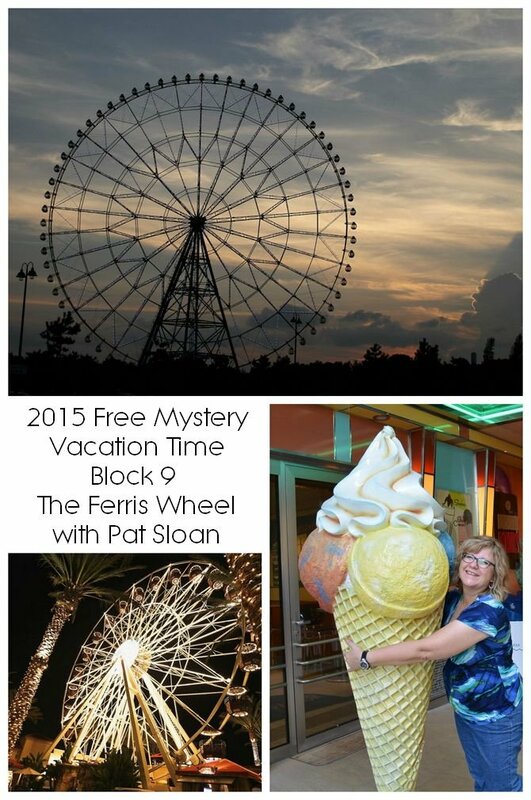 So far this year my vacation has not run into a ferris wheel that I could visit. On a trip a few weeks ago there was a fair right near our hotel and they did have a ferris wheel, but it wasn't open the night we were in town, I was so disappointed! I DID find a huge icecream cone this year on my travels so that was pretty fun! More from Pat - Visit My Post About Block 9! 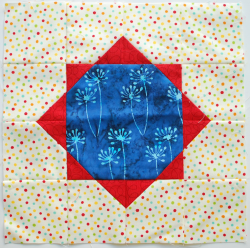 Our block for the Aqua and Navy version switches out the center. 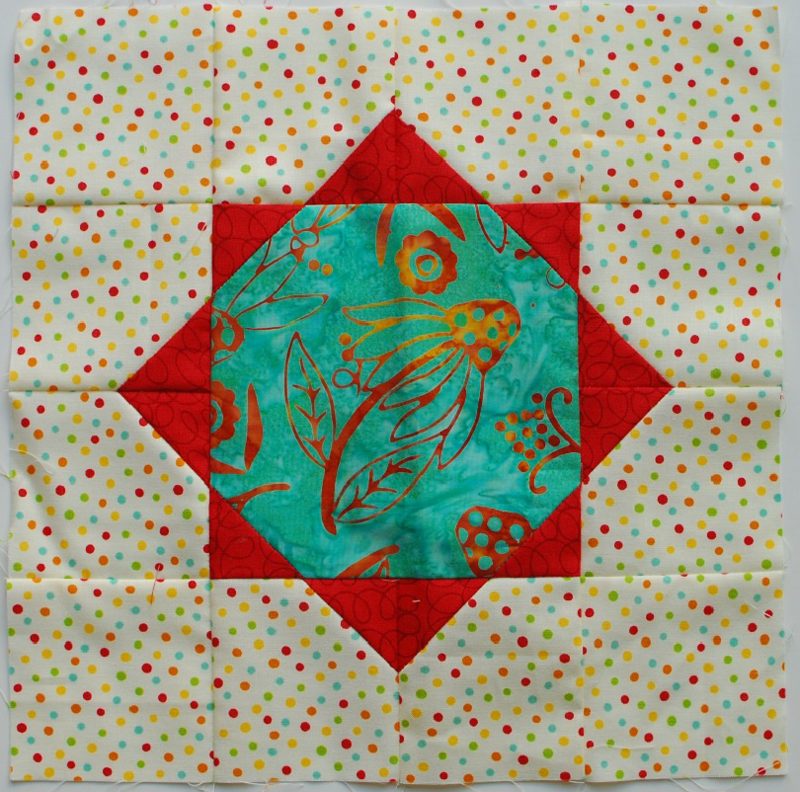 This is a large shape so you can showcase a nice part of your fabric, such as the coneflower I have on my aqua. It's also an easy block, because I know many of you are working on your inner border of Salt Water Taffy blocks from last month. 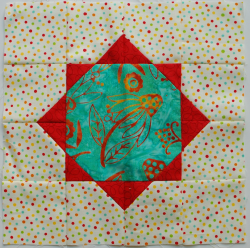 I use a sew and flip method for this block, and in my video I give you a tip, so be sure to watch my video! Now visit my article for a photo step out of sew and flip! Visit my blog post for block 9 by clicking here. And if you want to see a photo tutorial of trimming using the tool, I have one at this link.